Now we're planning for Monday. Regarding my purchase of an apartment, the contract still is not finished. A real estate agent with whom I never signed a contract demanding money from me, when for the last 2 months he's been lying and yelling to everyone involved and creating a huge mess and making everyone tired. He has called so many times in the last couple of days to yell at me (he also has yelled in the past at my lawyer, my appraiser, my mortgage broker, and the seller -- his own client), that it crossed my mind to find out whether Israel has such a thing as restraining orders. My own feelings of exhaustion and "being sick of all this" and hardly caring any more about the apartment itself, just finishing these stupid contract negotiations. At the moment, and with God's help -- because I need it -- we're scheduled to do the signing tomorrow. On a brighter note, my friend Rivka K. is in Israel on business, and we had dinner last night. She is so amazing. I wish I could see her more than once or twice a year. The turkey is in the oven, the side dishes are all baked, and I am taking a rest before washing all the dishes and welcoming my guests. I have much to be thankful for, as, God willing, I'll be signing a contract on Tuesday for the purchase of a new apartment. And of course, I'm thankful for my wonderful parents who are helping make that happen, and to my sister for being a great sister, and to my friends, and to my blog readers. My guests include Beth and Simcha, and Lisa S., and a lovely British couple who often have me over for Shabbat meals. As far as I know this is their first Thanksgiving feast, though I am not sure - I'll have to ask them. Well, the lawyers are working on the final version of the contract, and if it pleases the will of the Almighty God, I'll be signing it in a few days, and will be on my way to being a homeowner! Not exactly a homeowner, since the way things work in Israel is that the buyer pays in installments over a few months. In my case there will be about 8 months between the down payment and when I move in. Not my preference but that's how things work. Of course, this gives all of you, my faithful and beloved readers, plenty of time to click that "Donate" button there on the right and help me furnish this lovely space which, without your help, will remain very very open for a long, long time. Seriously, my possessions, other than kitchen items, consist of: a bed, a desk, several bookshelves. That is it. No closets, no couch, no table. We are looking at many, many months of living with a salon furnished with bean bags. Which is much better than living in a rented studio, but still . . . . Please help! In other news, I haven't mentioned that I've been sick for about two weeks. It started with dizziness and loss of appetite for a few days, then became a fever and congestion with several days of eating nothing but soup (I lost 6 pounds in 5 days), and is now winding down as a persistent cough. Not conducive to productivity, I must say. I have a few clients about to kill me. Finally, I'm so excited about Thursday! As is my custom, I am hosting a traditional Thanksgiving meal for couples who often host me on Shabbat but for various reasons cannot usually come to me, and have pulled out all the stops. The Turkey is ordered and the shopping list, which will include all-otzar-bet-din-no-heter-mechira sweet potatos, carrots, zucchini, onions, apples (which don't yet have a shmittah issue) and cranberry sauce (which is imported), is all written and ready to go. Thanksgiving and Otzar Bet Din: Two great things that taste great together! Shana may travel to Richmond, Virginia, or to Brooklyn or Monsey, New York. Her ears are pierced. An Alumnus writes: I have a friend in Richmond, Va. that ran away last week. I have been asked to get this email out to as many people as possible. 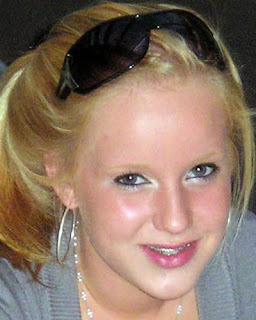 Her name is Shana Colby and she's 16 years old, blonde, and blue eyed. There are a lot of theories that she may have gone to New York and the hope is that especially with the everyone-knows-everyone factor in the Jewish world that someone will know someone who has information. We think she may be in danger and whatever anyone can do to help the situation would be appreciated. So if you guys could forward this email to as many people as you think would help that would be great (especially those of you in the metro-politan day schools). Note: If you decide to send an email around about this girl, please include, high up in your email, the date you wrote it, and request that anyone receiving it NOT forward it anymore after, say, a month without at least checking first at missingkids.com that she's still missing. I don't know what the story is here, but if there is any possibility that she's in danger, it's worth it to create hype. And, yesterday -- or two days ago? I can't keep track, I've been sleeping my fever away -- I brought an engineer to look at the new apartment before I sign any contracts. He found two important structural problems. Both can be fixed, but the question is: who will pay for it? And when? and if we include in the contract that the seller must fix it, what happens if she doesn't? Or what happens if it's not fixed well? I'm not looking for advice -- thank God, I've got a fantastic lawyer and several home-owner friends who are helping to keep me sane -- but it's all such a nightmare, especially since the seller has been really difficult this whole time. But I really want the apartment, if these things get fixed. Tell me again . . . ? So, Hamas, the party that was elected into power in the PA, kills some of their own fellow Palestinians at a Fatah rally, and we're supposed to establish peaceful relations with them how? What exactly is supposed to happen in Annapolis? I'm so confused. Why not just give up the pretending and admit there won't be peace for a while? Let Hamas do their thing, and say "we'll get back to you guys in a few years, if you've gotten your act together." This whole cycle of empty peace-making promises -- every few months, a new meeting, every few months, nothing happens -- just causes fatigue and even deeper cynicism than before. Let's give it a rest. Maybe we'll pick it up again after the next PA election, OK? If there are two things that really bother me, it's intellectual dishonesty, and hypocrisy. I have always worked hard on being straightforward, accepting the truth, doing as I say and saying as I do. But lately I've come to admit to myself that there are a great many things about which I am, indeed, hypocritical. Which means that I'm a hypocrite about hating hypocrisy. Don't worry, I'm not upset or anything. I'm not beating myself up. I made this observation in more of a laughing-at-myself sort of way. This is not meant to be heavy, have no concerns. I've found an apartment! I hesitate to write about it now, because I haven't signed the contract for it, and in Israel, until one has signed the contract, the seller can pull out of the deal at will. So it's not a done deal. But we've been "in the process" for a while now . . . the seller has been a bit difficult and we had several obstacles to overcome in the negotiating process . . . I have a fantastic lawyer and a fantastic mortgage broker . . . and we're at the stage when the contract is almost finished, and I'm bringing in an engineer to look over the building structure, and I'm calling the neighbors to introduce myself (and see if any of them are crazy). It's located in a very nice neighborhood called San Simon, down the street from a large synagogue and a 10-minute walk from a reasonably-priced supermarket and the post office. There is also a well-stocked grocery store across the street, and it is exactly a 25-minute walk to the corner of Emek Refaim Street and Rachel Imeinu. Yes, I timed it. The only down side (other than having to walk an extra 15 minutes to my favorite hangouts, but I guess I'll live) is that it is a 4th-floor walkup. Between 4 flights of stairs and the extra 15 minutes in the walk to Emek, I'll be getting into really good shape. Of course, the silver lining is that I have a nice view, and since I'm on the top floor I won't have to worry about who might be stomping around upstairs. Also, the Va'ad Bayit (building committee, which organizes care for common spaces) is arranging for everyone to build balconies onto their apartments, b'H within the next 2 years. It is an extra cost, but not a high one since the whole building is doing it, and I'll be able to have a succah! And a balcony with a nice view! Barbecue at my place! And then, if the stars align correctly, perhaps they'll add an elevator. Meanwhile, I'm so excited about the idea of having my very own place. With a salon. And an office. No more working and hosting in my bedroom! There is, though, the issue of furniture. Once I pay for the apartment, and the broker, and the lawyer, and the mortgage broker, and the purchase tax, and the mover, and the painter (the only renovation I'm doing right now; I can't afford more and anyway the apartment, though not exactly the way I'd like it, is perfectly acceptable the way it is) . . . there's precious little left over for furnishings. I'll need, immediately, a closet and a kitchen table, neither of which I currently own (my current place has a built-in closet, and my desk doubles as a table). And, to fully use all my new space, I'll need another closet, another bed, a sofa, coffee table, and a couple of chairs, a small dining table, and some sort of closet for coats and boots. Did you realize that my birthday passed on August 18, and I neglected to post my annual birthday wish list? And, you know, chanukah is coming! So I'm making a brazen request -- or, to put a more positive spin on it, giving you a chance to help with a mitzvah of yishuv ha'aretz? -- to please help me furnish my new apartment! See, on the right, I've created a "donate" button through PayPal. It's easy and fun, and of course I'll be using the new stuff to host lots of company, including visitors from abroad. Please help me buy a couch! I took this quiz months ago, and the result was, correctly, that I'm from the Boston area but not from Boston itself. Apparently they've tweaked the quiz because this is my new result. Not a shocking result, since most people who find out I'm from metro-Boston say "but you don't have a Boston accent." Having parents from outside the area, and going to school with people who, almost to the person, also have parents from outside the area, is not conducive to developing a local accent. A couple of weeks ago, the Times' Real Estate section published a story about an American couple who bought a luxury apartment in Jerusalem and had it decorated by a New York designer. The day the article came out, I sent in the following letter. Since, at this point, they clearly have no plans of publishing it, I'm sharing it with you here. Interestingly, shortly after I sent this letter, a local Hebrew paper published a 3-page feature article on this very topic. It made me feel so "in the moment." an apartment – or several apartments – that are dark for most of the year. To Americans with money to kick around and a love for Israel, I suggest alternatives: buy Jerusalem real estate and rent it out to Israelis, so the property will be inhabited year-round; come on more vacations and patronize Israeli hotels, restaurants, taxis, and stores; start a free loan society to help Israelis buy homes in Jerusalem; or move here permanently, and turn your New York home into the vacation home. We’d certainly love to have you here! My story published "All over the place"
Yesterday I added a new feather to my proverbial career cap, covering a story for a wire service. It's not an emu feather, but close enough. I attended the ceremonies to commemorate the 90th anniversary of the Battle for Beersheba, which I'd first read about on Treppenwitz.com, and covered the day's pageantry for the Australian Associated Press. For the connection between the story and emu feathers, you can read my story here, or get more of the historical details over at Trep. I'm told that my work is now "popping up all over the place," though usually without my name attached. If you see it in your paper and it says "source: AAP," then that's me! Yay! You can see my pictures here. They are numbers AAP 810-814, and AAP 822. Considering that I'm using a high-end layperson camera rather than the $2,000 - $5,000 cameras the "real" photographers were using, I think I did OK.
Michael Ramsay of Carnoustie, Scotland explains the concept of a clan tartan to Be'er Sheva residents Eliza Frankel, 15, and her sister Deanne, 9. Behind them: Members of the Australian Light Horse Association. It was a fun day. I want to thank the AAP for paying me to attend the events, and David von Treppenwitz for supplying me with information, several rides within and from Be'er Sheva, his internet connection, and dinner. It turned out to be an 18-hour day, and his help made it easier. If you see my story in your local paper, please provide a link in the comments. Thanks! Just a little public service announcement, to keep us all as thoughtful and sensitive as possible . . .
Never say anything to a single person that you wouldn't say to an infertile couple. It's a pretty easy rule of thumb to follow, really. If you wouldn't say "soon by you" (say, at a bris) to a couple who has been married for 8 years and hasn't had any children, then you may want to think twice before saying "soon by you" to a single person at an engagement party or a wedding. If you wouldn't say "may we hear happy news from you soon" to a woman who has been undergoing invasive fertility treatments, then avoid saying it to a person who has been dating for a long time. Obviously, if you are tempted to say one of these phrases, then you mean really well and sincerely want this single person to be happy. But actually -- you may not realize this-- many, many singles find these phrases, if not outright painful, then annoying at best. How about just saying "all the best to you" or "may Hashem bless you with only sweet things"? These are very kind, generic sentiments which, when said sincerely, mark you as a nice and friendly person, without drawing unfortunate and unwanted attention to the single person's state of singlehood. In the interest of lifting us all up to higher levels of sensitivity, I would like to add an example that is not much discussed: the mass emailed birth story. Let me explain what I'm not talking about. Birth announcements are great. A formal card or an email which announces the birth is clearly something that you would send, even to people struggling with infertility (if they are close to you), because, after all, the fact that you had a baby is important news to anyone who cares about you. "I'm pleased to announce that my wife Rachel gave birth on Monday night at 4:30 am to a beautiful little boy. All went well, thank God, and mother and baby are fine (if more than a little tired). Rachel and the baby are expected to come home this afternoon, and the naming will take place tomorrow morning at Congregation Shomea Tefilla. Details about the bris are forthcoming. May we all share happy occasions. All the best, Josh Cohen." From this short email we know a lot of information, either stated or implied: that the baby has arrived, it is a boy, it is healthy, and that Rachel Cohen has had a normal birth -- that is, an extremely tiring and probably very painful experience which resulted, miraculously, in the emergence of a precious new human being. We know that the couple was up all night. We know that the father has survived the experience and is very happy and has lived to write this email. We know that Rachel and Avraham consider us to be close enough friends that they want to keep us informed of this very important event in their lives, and that they will continue to inform us of events that have communal import, such as the bris. In other words, we know all that we really need to know, and perhaps then some. All the important points are included. Anything that is really our business, and which keeps us feeling emotionally close to the couple, is included in those five lines. "The baby is doing fine. Unfortunately, Rachel had some complications and will remain in the hospital for a few more days, but we expect that we'll all be reunited at home next week. Her mom is in town helping out, so we're doing OK on the food end (thanks to everyone who offered to cook), but we could use some babysitting help for our older kids in the early afternoons if anyone is available." This announcement is a good one because, in my opinion, it is safe to assume that those who care about the couple at any level will want to know how the mom is really doing and why she's not coming home yet, and how they can help. Those who are very, very close to the couple might feel comfortable calling to find out details about what happened . . . and those who are squeamish or not quite that close to the couple can send best wishes (or offer to help, without finding out details of what is going on). The key is to share news, without making anyone feel that you are divulging Too Much Information . . .
. . . and without making any of your friends who are struggling to have children, or who are in their 30's or 40's and unmarried and therefore do not have a chance to have children, know that you are so incredibly happy about the new baby, floating so high in the mists of rapture and exhaustion and physical trauma and wonder and stress and complete disbelief that this tiny little person is your responsibility, and did I mention exhaustion? and awe? and stress? that you have forgotten that they are unable to experience those feelings themselves, and might be feeling sad about that. Mild contractions started on Saturday right after kiddush. My mom had arrived on Friday, just in time. The pains got stronger and slightly more frequent on Sunday, but I was feeling pretty good and we actually went shopping. Water broke and we decided to go to the hospital on Monday at 5 pm . . . this was the name of our nurse . . . and our midwife arrived at 6:30 . . . and I didn't get any drugs, though by midnight I was sorely tempted. . . hard labor lasted for 3 hours, I started pushing at 4 am . . . he came out slick and crying and beautiful and the midwife said it was the most peaceful birth she'd ever attended . . . I have a therapist friend who encourages new mothers to write down their birth stories. It helps the mom process this profound event, and of course it is really nice, down the road, to have the details that otherwise one might forget over time. The story is a treasured and precious memory to write down, and to hold on to. Giving birth is a big deal. Writing down the story is a healthy and helpful thing to do for the family, and perhaps for any extremely close friends who really want to hear the entire event from beginning to end. And . . . if you are ever tempted to send this sort of text out in a mass email, please be very careful when creating the recipient list, and ask yourself "for whom is this too much information?" It's so easy, when you have so much going on, to just choose all your friends from the address book and press "send" . . . and for very understandable reasons you are in a haze right now . . . and you are, indeed, safe in assuming that any normal person would be happy for you, because who wouldn't be? . . . so how impressive and amazing and gracious would it be if, in the most profound moment of your life, you take a moment to consider the feelings of others? No one expects this of you, but it would indeed be extremely gracious. Oh, and mazal tov on the new baby! May he/she quickly learn to sleep through the night, and may he/she grow up to Torah and good deeds . . . and chuppah, please God.